Perhaps the strongest drafting table on the market. Durable steel frame construction. Thermally-fused woodgrain melamine top with steel end cleats and front paper apron. 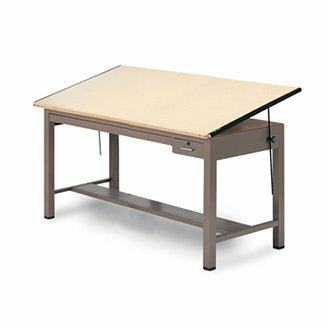 Drafting table work surface tilts up to 50 degree horizontal. Specify Desert Sage, Gray or Black base when ordering drafting table. Mayline Color Chart. Drafting table includes a lockable tool drawer and shallow plan drawer. Assembly required.